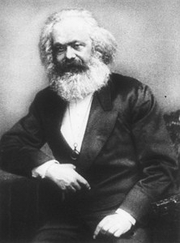 Karl Marx (1): Philosoph, 1818-1883. Karl Marx (2): Komponist, 1897-1985. Karl Marx, Marx & Engels: Basic Writings on Politics & Philosophy. ; Friedrich Nietzsche, Beyond Good and Evil: Prelude to a Philosophy of the Future. Karl Marx is currently considered a "single author." If one or more works are by a distinct, homonymous authors, go ahead and split the author. Karl Marx is composed of 16 names. You can examine and separate out names.